Why Do You Always End Up In The Slowest Line? Mathematicians have confirmed what you, in your heart of hearts, have long suspected: The odds of picking the quickest line really are stacked against you. 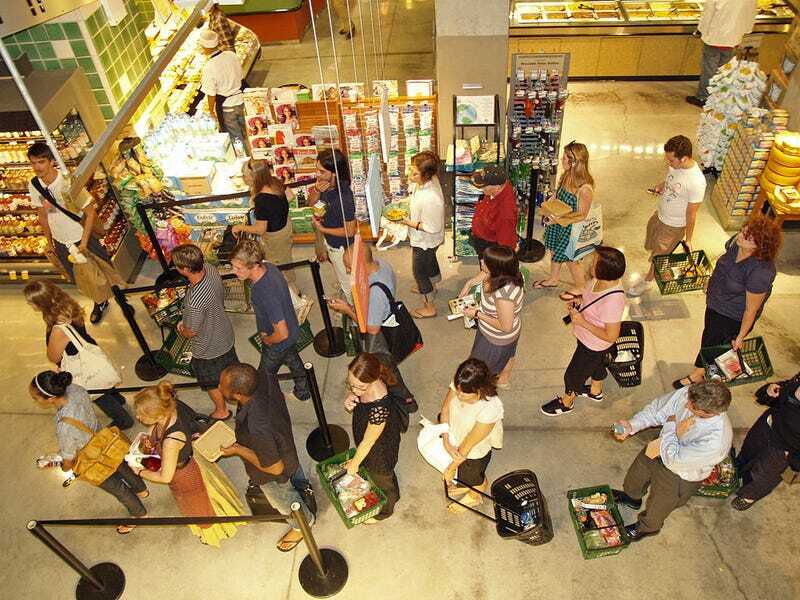 Queueing theory explains why there's probably no way you can always be in the fastest line. A grocery store tries to have enough employees at the checkout lines to get all their customers through with minimum delay. But sometimes, like on a Sunday afternoon, they get super busy. Because most grocery stores don't have the physical space to add more checkout lines, their system becomes overwhelmed. Some small interruption—a price check, a particularly talkative customer—will have downstream effects, holding up the entire line behind them. If there are three lines at the store, these delays will happen randomly at different registers. Think about the probability. The chances of your line being that fastest one are only one in three. Which means you have a two-thirds chance of not being in the fastest line. So it's not just in your mind: Another line is probably moving faster than yours. Queueing theorists have come up with a good solution to this problem: Just make all customers stand in one long snaking line, called a serpentine line, and serve each person at the front with the next available register. With three registers, this method is about three times faster on average than the more traditional approach. This is what they do at most banks, Trader Joe's, and some fast-food places. With a serpentine line, a long delay at one register won't unfairly punish the people who lined up behind it. Instead, it will slow everyone down a little bit. So why don't most places encourage serpentine lines? Here, we're getting into customer psychology. We human beings like to think that we're in control of our lives and can beat the system if given the chance. Researchers have noted that some customers balk at serpentine lines, which can stretch much longer than the more traditional approach, preferring their chances of winning the lottery with multiple lines. You can read more about the theories behind how we wait in line at Wired.